Unlike humans, birds do not have the luxury of high-powered heating systems or thickly insulated parkas to help them keep warm throughout the winter. But birds have a variety of unique adaptations that help them survive in cold climates, from a special oil that waterproofs their feathers to scales that keep their feet warm, according to the U.S. Fish and Wildlife Service. For one, birds have significantly higher rates of metabolism and burn more energy to stay warm than humans. One example are black-capped chickadees, which weigh less than half of an ounce but are able to keep their body temperatures at 100 degrees Fahrenheit, even when the air outside is freezing. How do they do it? The chickadees rely on their bodies’ natural insulation, but they also remain extremely active, in part by shivering, just like humans do. They also maintain a consistent supply of food, which is extremely important given that chickadees eat more than 35 percent of their body weight every day, according to USFWS. Like chickadees, all cold-weather birds depend on some form of insulation – fat, fur or feathers – to keep warm. Many birds, like owls, make sure to fluff their feathers consistently. Cold-climate birds also add extra body weight in late summer and fall in preparation for winter. Another defense against the cold involves trapping pockets of air around their bodies for an additional layer of insulation. In order to preserve these barriers against the cold, many birds apply an oil produced by a gland on their tails through a process known as preening. One well-known example are penguins, who each year clean, rearrange and oil their feathers, which are not naturally waterproof. Not all birds use the special oil to insulate themselves, however. According to USFWS, birds like egrets, herons and mourning doves grow a special type of feather that disintegrates into a powder, which the birds then use to waterproof their feathers. Like humans, birds look to each other to keep warm during winter. 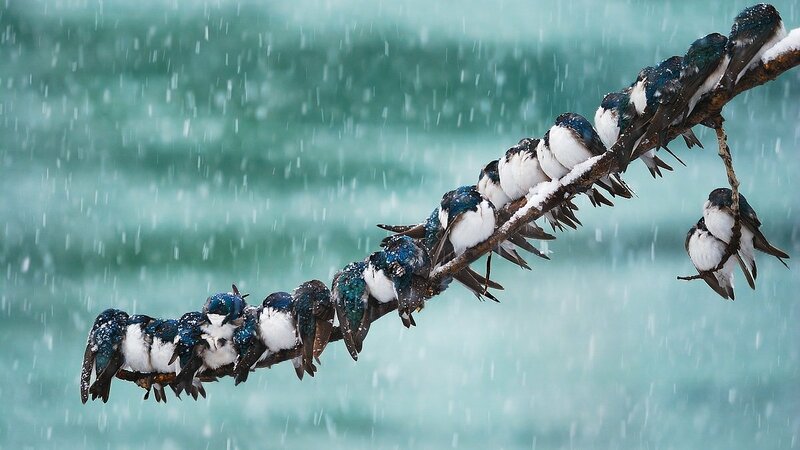 In what could be described as birds’ form of cuddling, tree swallows and other small birds will huddle together in shrubs, vines and trees to create warmth by sharing their body heat. For so-called “cavity nesters” – like nuthatches and downy woodpeckers – holes and indents in trees serve as a refuge from the cold. In addition to providing warmth, these cavities help birds hide from predators. Another natural adaptation that helps birds survive cold winters comes in the form of special scales on their feet and legs, which help to reduce heat loss. Many longer-legged birds – including ducks, geese, pelicans, gulls and swans – will keep their legs and feet warm by standing on one leg or sitting down. This allows them to isolate the blood that flows through their legs as opposed to distributing it throughout their bodies. Despite all the natural adaptations that help birds make it through long, cold winters, they can use some help from humans. According to USFWS, especially during winter, people should stock bird feeders with high-energy foods, like peanuts and black oil sunflower seeds. Those looking to help can also install roosting boxes that allow birds to keep warm, along with adding a heater to bird baths to help birds stay hydrated throughout the winter.